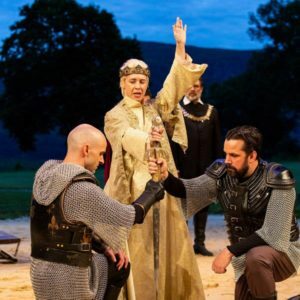 In today’s Wall Street Journal I review two of the Hudson Valley Shakepeare Festival’s new productions, Richard II and The Taming of the Shrew. 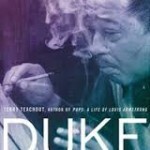 Here’s an excerpt. Ms. Coffey, who first came to my attention when she appeared in Mr. McCallum’s 2014 Mint Theater revival of John Van Druten’s “London Wall,” is at home with both aspects of Richard II’s cloven personality, pivoting from arrogance to desperation so smoothly as to suggest that both qualities are opposite sides of the same coin of character…. In the #MeToo moment, how can “The Taming of the Shrew” be staged without setting off alarm bells of political incorrectness? The best way, it strikes me, is to play it the way Shakespeare wrote it, as a slapstick comedy in which a proto-feminist hellion gets her comeuppance at the hands of an arrogant man, and let the audience draw its own conclusions about what it’s seeing. 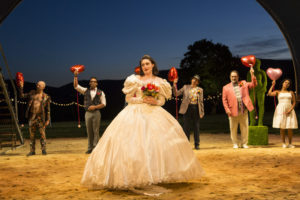 This is more or less the way Shana Cooper approaches the play in her Hudson Valley Shakespeare Festival directorial debut, and the results are consistently satisfying—the best “Shrew” I’ve ever reviewed, in fact. Ms. Cooper, a newish face on the theatrical scene, has written a program note that bristles with up-to-the-minute notions (“The world of ‘Taming’ is one…in which women are judged and punished for not adhering to the rules of the game as dictated by a patriarchal society”). But whatever her production really “means,” Ms. Cooper’s “Shrew” plays as a riotously bawdy baggy-pants farce, one whose director is unafraid to opt for broad comic gestures and whose cast is more than happy to oblige her….